Support and celebrate local craft beer culture. Already a member? Sign in or reset your password to view your subscription. Become an IN Beer Brigadier for access to local one-off, small-batch collaboration beers available exclusively at annual release events in breweries across Indiana and at Tomlinson Tap Room. You’ll also get limited edition glassware specially paired and handpicked by the brewers themselves, a members’ T-shirt, and exclusive discounts and experiences from Indiana breweries throughout the year. See the full member benefits below. 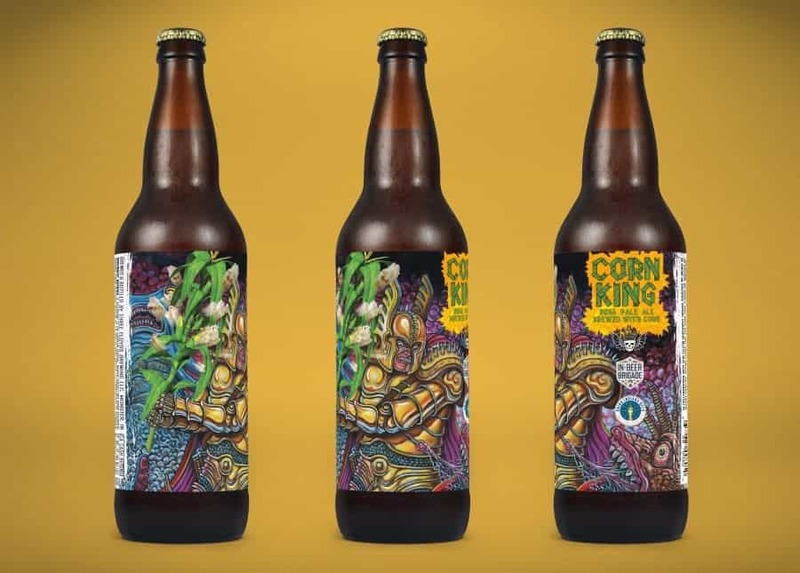 Entrance for you and a guest to your choice of annual IN Beer Brigade collaboration bottle release events at locations across the state, with complimentary carry-out**, in late 2019/early 2020, to be announced. The most recent release included four 500ml bottles of Lindera (see below). Non-members may purchase a membership at the events for $75 to receive complimentary carryout and the additional benefits listed below. Member’s IN Beer Brigade t-shirt. 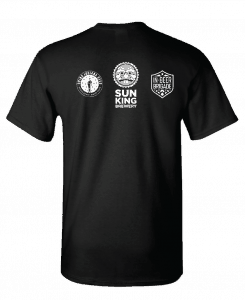 New members will receive an IN Beer Brigade logo tee with their complimentary beer and glassware, and renewed members will receive a tee featuring the year’s collab beer and host brewery logo. Specialty glassware selected by the brewers and paired specifically to the style of each year’s beer. You will receive your limited-edition glassware at the annual bottle release event. Fewer than 1,000 glasses will be produced. The most recent glassware was the Ritzenhoff Sommelier 16 oz. goblet (see below), paired with Lindera. Advance notice of Guild festival ticket sales and members’ only discounts. Current festivals include Winterfest, Blooming Craft Beer Festival, Indiana Microbrewers Festival, South Shore Beer Fest, and Broad Ripple Beer Fest. The third annual IN Beer Brigade collaboration beer was Lindera, a Barrel-Aged Fruited Sour Ale aged on Blackberry and locally foraged Spicebush, brewed by Upland Brewing Co. in collaboration with South Central Indiana breweries and the Brewers of Indiana Guild, especially for IN Beer Brigade members. 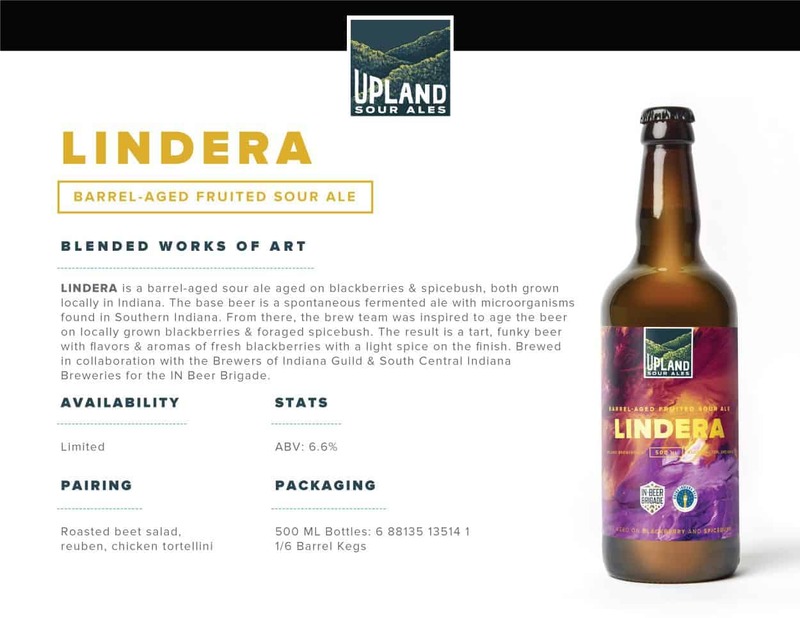 Lindera was first available for IN Beer Brigade members to taste at the 2nd annual Broad Ripple Beer Fest, then released at bottle release events across the state in January and February of 2019. Members received one 16 oz. Ritzenhoff Sommelier Goblet glass, limited to 1,000 pieces, along with four 500ml bottles of Lindera for complimentary carryout from the release events at Upland, Maidens, New Albanian, Trubble, Heavenly Goat, New Oberpfalz, Hunter’s, Union, and Sun King breweries, along with Tomlinson Tap Room. 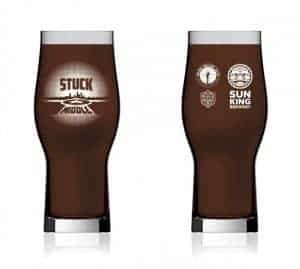 What is Sun King Brewing Company when they hosted Central Indiana brewers for the second annual Indiana Beer Brigade collaboration? Stuck in the Middle. Inspired by the taste sensations of s’mores, this Indiana Imperial Stout brewed for IN Beer Brigadiers was sweet and smooth thanks to lactose sugar and chocolate malt, with a hint of barrel-stave smoked barley from Sugar Creek Malt Co. Pour the can and get roasty and toasty with this big, bold beer. 2017 IN Beer Brigadiers received four 16 oz. cans for complimentary carryout from the can release event of their choice, along with specially paired glassware. 2017 members received a limited edition 16 oz. Rastal Craft Master Two Tumbler glass at the Stuck in the Middle release event they attended. Fewer than 1,500 were produced. 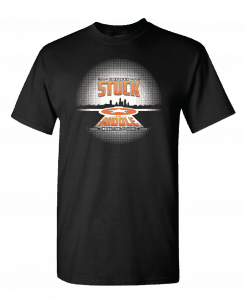 2017 renewed members received the Stuck in the Middle collaboration tee pictured above at the release event of their choice. 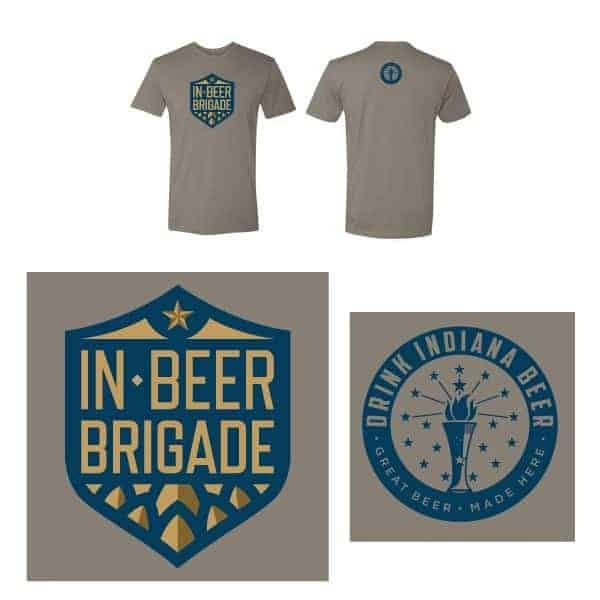 New members received the IN Beer Brigade logo tee, below, and could purchase the collaboration tee at the release event of their choice. 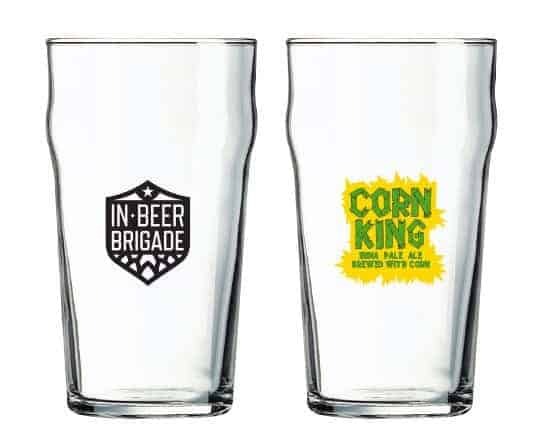 2016 members received the 3 Floyds/IN Beer Brigade Corn King IPA nonic English pub glass. *IN Beer Brigade membership is available for people ages 21+ only. Membership is non-refundable and non-transferable. Membership may be revoked at any time for any reason. Member event details and benefits are posted as they’re confirmed. Packaged beers are available only at the release events. 21+ proxies may attend for members who can’t be there. Government-issued IDs will be checked and membership will be verified at all IN Beer Brigade events. See the FAQ for more. **IN Beer Brigade beers are one-off batches brewed in limited quantities. If the current batch runs out, new members who join after it’s no longer available will receive the next available beer.